Posted Jun 21, 2018 by Eds. 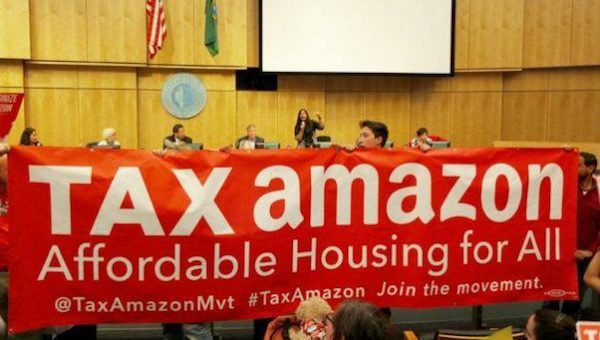 Only days after passing a tax on Amazon and big business in Seattle, the corporate politicians in Seattle repeal the ordinance. Watch Socialist Alternative member and Seattle City Councilmember Kshama Sawant’s reaction in her speech from Council Chambers (text below). Also, scroll down for further commentary from Socialist Alternative members in the public comment section of the meeting. Thank you to all my fellow activists, not only for your coming today, but also for the months and, in many cases years, of the organizing and the movement building that we have engaged in together. As the Seattle Times reported recently, nearly 23,000 working families in Seattle are extremely rent burdened, meaning they pay more than half their income on rent. And as one of my union sisters said today, “who are these people?” These are custodial workers, grocery store workers, educators, cafeteria workers, administrative workers. Basically, we’re talking about all the working people who go to work every day and make the city run and without whom this city would come to a standstill within hours. We know that rent is skyrocketing. The median home price is now well over three quarters of a million dollars. Real Change was here today in City Hall ringing the gong for hours to indicate our thousands of unsheltered neighbors. Women In Black report that already this year at least 53 people have died simply because they did not have shelter. The Democratic Party establishment which controls the city has presided over this crisis over decades. This is not a crisis that happened in a day, or a month, or a year. This has been decades in the making. They have let it worsen with no real solutions. And we know not only from our knowledge of economics but we know from common sense, from the status quo, that the only solution to address the affordable housing crisis is for the city to build social housing which is publicly owned, permanently affordable housing. And we also know that is completely rational and the only idea to raise revenues is to go to those who have not paid anything close to their fair share which is Big Business. So in the face of decades of in action by the elected leaders of the Democratic Party, our movement composed of ordinary people, renters, housing activists, homeless people…We built our movement from the grassroots. We got organized. We got organized and we built the people’s budget struggle last year through which we brought 400 people to the public hearing who spoke with one voice. “City council, do your job! Tax big business so that we can begin to address the affordable housing crisis.” That night we engaged in peaceful civil disobedience in an overnight occupation of City Hall. It was because of our courage, determination, and our strategies and political clarity that we then finally came to that unanimous vote on May 14. It was because of our leadership as a movement, not the leadership of the politicians of the Democratic Party. Now less than a month after that unanimous vote, these council members are going to overturn that hard won victory of our movement. No doubt there are several council members who worked on this but I don’t think this is in anyway an appropriate moment for council members to be patting their own backs about the work they did. It is the result, in fact, in many cases of thousands of activists who have fought year after year, decade after decade, for some social change. It is their political leadership that leads this way. And now, in lightening speed with zero accountability to our movement, zero accountability to renters, zero accountability to the majority of the people in this Seattle who are reeling in this acute affordable housing crisis. These councilmembers are set to destroy within a day’s time what hundreds of us spent months fighting for. Why? Why are they doing this? What has changed? What is different in Seattle? Are we expected to believe that Seattle is somehow now more conservative than the rest of the country on this issue? Of course not! Seattle is more progressive and has a history of being more progressive than the country at large. What has happened is there has been a tsunami of propaganda from Big Business, lies, and distortion, and misinformation. And yes, it is true. It has had a temporary effect on the public opinion. But I have a news flash for this council. This was never going to be easy. It is no surprise in any way whatsoever that Big Business has launched a campaign of lies and distortion. This is what they will do. To quote Tim Harris from earlier today, “any progressive measure you talk about, you will find Big Business opposing it.” So why is the council stunned this is happening? This is exactly the kind of onslaught of lies and distortion and misinformation that came at us when we began building the 15 Now campaign. What would history have looked like at this point if the 15 Now Movement had said, “Big Business is opposing us, they’re spreading lies, they’re impacting public opinion! Let’s fold our tent and go home!” What did we do instead? We built a powerful grassroots movement. We engaged in a citywide door-knocking campaign. We had neighborhood meetings. We had rallies, protests, marches, town halls, and we changed public opinion to the point that the vast majority of Seattle and the nation supports $15 an hour. We not only won 15 here. We have now won 15 in many other cities. So, I don’t accept even for a second this idea that we are now forced to repeal because there is onslaught from Big Business. No! While councilmembers were meeting behind closed doors last week, I wasn’t among them, to plan this repeal, what was our movement doing? Our movement was gearing up to begin building that campaign so that we could knock on the doors of tens of thousands of voters throughout the summer and fall so that we can push back against the referendum. Is that a guarantee that we would have won despite that? No! Of course there is no guarantee! But there was a chance of winning. And I can tell you something. With this capitulation, there is a guarantee that this will be a massive setback for the movement. That much is guaranteed. Many councilmembers have said on various occasions including in their speeches today, they’ve indicated that they’re forced to do this. This is the sober, responsible thing to do. Why stand before you as a councilmember, as an elected representative who is completely disagreeing that there is sober responsible thing to? No! This is a cowardly betrayal of the needs of working people. The only sober responsible thing to do is to stand strong on the Amazon Tax today and pour our efforts as elected representatives, stand with the movement, stand with the people, and spend the summer and the fall really changing public opinion which I know can be done. By walking away from this tax today, this council is forcing upon us the loss of a huge opportunity that our movement had created to finally begin to turn the tide on regressive taxation and the gross underfunding of basic needs like affordable housing. This is, let’s call it what it is, it’s a capitulation. And it’s a betrayal. And it’s a kowtowing to Big Business and to corporate politicians like Jenny Durkan and Chris Gregoire. And this is not the first time this has happened. This is exactly the process through which Washington State ended up getting its regressive tax system through decades of capitulation by Democrats to Big Business and the Republicans and the Right Wing. By betraying again and again and again working class people. That is why we should not forget the example of Boeing. Boeing made the same kinds of threats like Amazon and other Big Businesses are making today. But Boeing did that decade after decade. And the legislature caved to them decade after decade. And the logic was always, well you can’t fight Big Business and if they threaten to take away jobs, then we have to accept whatever they want. Boeing executives got everything that they wanted in the name of not taking away jobs and what did they do? They took the jobs away anyway. So I think we have to understand that the logic of bending to Big Business points only in one direction which is a race to the bottom for the rest of us. I have full confidence that if we were to engage in a real public campaign to educate voter opinion, there is no question that working people will be on our side. Right now, they have been at the receiving end of a systematic corporate and media campaign where they have been told lies after lies. They have been told this is a Tax On Jobs. They have been told that this tax will ultimately end up taxing them. They have been told the lies. So I have to say I’m quite disappointed and upset that councilmembers like Herbold and Gonzalez are ultimately placing the blame on the people, on working people! This is wrong! This is wrong! Elected officials have no business blaming ordinary working people if they don’t agree with this tax. It is because of the onslaught of lies that this has happened. And we as working people should have the confidence that we can change the minds of other working people like ourselves. Because stop any random person on the street down there and ask them, “do you think Amazon pays its fair share?” And they will tell you no. Ask them, “do you think we need affordable housing?” They will say yes. “Do you think Big Business should be taxed for that?” They will say yes. And where would we have been if we had used this logic of blaming working people? Do you think working people agreed immediately on marriage equality, on gay rights, on trans rights, on $15 an hour. No! We engaged in a conversation with them to bring everyone together. Only weeks ago, Ireland which has been dominated for decades by the Catholic Church, just engaged in a public referendum with which flying colors rejected abortion restrictions and voted for abortion rights. Every rural county in Ireland voted for abortion rights. That is how we have seen change happen every single time. When we go out and base our strength on working people like ourselves and not engage in what I think is magical thinking that somehow, at some point, you’re going to be able to convince Jeff Bezos and the executives at Starbucks and Facebook to be on your side and to be okay. So I ask you this too. And I ask the council this question about strategy as well and this is a question for our movement. What is the strategy to go from here? What is the replacement? What is the Plan B? It is all very well and good for councilmembers to say that they are willing and excited to work on a Plan B but what is the Plan B?!?! There is no Plan B and as a matter of fact the only logical solution to this affordable housing crisis is to build social housing by taxing Big Business which leads me to the next question about strategy. Do councilmember’s actually believe that by completely capitulating to Big Business today, somehow we are going to be in a better situation next year to win this?! Or would we have been in a better situation to win this next year even if we had not won on the referendum but by the end of October we had convinced tens of thousands of people to be on our side, to get ready, to gear up for a fight next year. That’s the question. So ultimately sisters and brothers, for us the question is of strategy. Are we going to engage in this failed strategy of continuing to put our faith in politicians of the Democratic Party? However well meaning they say they might be. However how much they say they want to tax big business to solve the affordable housing crisis. What is the strategy for our movement? We are seeing unfolding right in front of our eyes what happens when you put your faith in politicians who are not willing to fight the good fight with us and are worried about what the chamber is saying, worried about what their corporate colleagues are going to say, worried about what Mayor Jenny Durkan is going to say. And putting the blame on working people! That is the most shameful thing. That saying working people are no longer on our side. That is not correct. And so ultimately for us, the lesson here is we cannot put our faith on politicians who are not willing to stand fight with us and that is why our movements needs our own independently elected candidates who are willing and able to really fight against Big Business. Who understand that it is magical thinking to believe that somehow you will be able to win a tax like this without making enemies out of Jeff Bezos. No! Jeff Bezos is our enemy! He is our enemy! And we have to fight Big Business. The question is will we have elected representatives who will fight with us or not? That is the question for us. That is why I urge you all to join me on June 30th at 5pm at Langston Hughes because that is where we will discuss the lessons and the next steps for the Tax Amazon movement. And I will say one last thing. For the many who have said, even well meaning people who have said. “Well, this is not a perfect solution. But you know we should still do it.” I beg to differ. What does it mean for it to not be a perfect solution? Would it be better if the state legislature and the federal government somehow turned socialist today and really made our lives better? Of course! But does it make sense for us to hold our breath that they will do that? No! Absolutely not! And this tax that we are talking about, the Amazon Tax, is from an economist standpoint and I’m speaking as an economist, is completely progressive. It is a progressive tax. It is a progressive tax. And if we are tired of regressive taxation in this state, then any progressive tax is the perfect solution. So let us not as a movement cede that ground. Don’t go door knocking and say, “this is not a perfect solution but will you be with me?” No! Say, “this is the perfect solution because it is a progressive tax in a state with regressive taxes. Are you with me so we can make the lives of working people like yourselves better?” That’s the question to ask. Thank you.